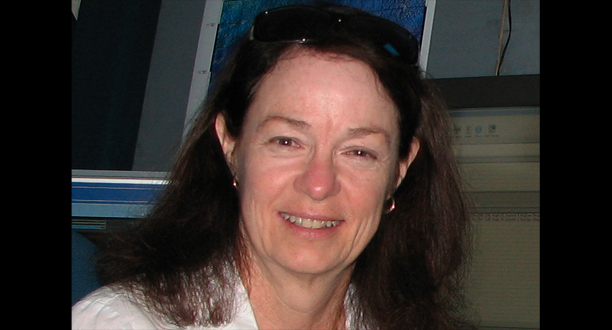 I’m Patty Fryer, a marine geologist from the University of Hawai’i. I was invited by Jim Cameron to participate in this expedition, and, having arrived, I am now sitting in the Mermaid Sapphire’s galley, where there is good Internet connectivity—and tea. I’m going over bathymetry (ocean depth) maps of the Challenger Deep region that my colleague, Sam Hulme, just emailed to me. Sam works at Moss Landing Marine Labs in northern California. We came out here in 2009, when he was my gradate student and we mapped the Challenger Deep from the Hawaii research vessel Kilo Moana. We were working with the team from the Woods Hole Oceanographic Institution that built the hybrid remotely operated vehicle (ROV) known as Nereus (check it out here). Nereus was designed to dive to the deepest parts of the oceans—the trenches—and we were present for its field test, which was its first deep-diving mission. 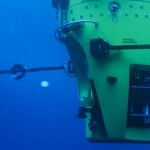 This expedition contributed data used to map the deep-ocean trenches in greater detail. As I drink my tea aboard the ship, I am currently reviewing a map with close-ups of the region that Jim will dive tomorrow—the Challenger Deep. I am reviewing these maps using a Gerber Variable Scale, a great device that helps you to measure distances on any size map and convert distances between maps using different scales. The Gerber Variable Scale is like a ruler, except that the markings are on a spring-loaded “ruler.” This enables users to make the distances between incremental markings either farther apart or closer together by adjusting the spring to a map’s specific scale. I’m using this tool now to measure how far Jim will be able to travel along the seafloor of the Challenger Deep and up the inner trench slope. 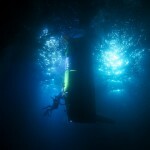 He told me that the farthest he has gone, during an earlier dive, was four kilometers (nearly two and a half miles). The dive traverse we planned with Jim for tomorrow begins within the Challenger Deep part of the southern Mariana Trench. This is where the Kaiko and Nereus ROVs dove and found the greatest depths. Jim will follow a traverse starting in the southeastern part of the depression and will move northeastward across the Challenger Deep. He will turn northward when he reaches the edge of the overriding plate and climb the steeper part of the slope to look for exposures of rocks from the upper part of the Earth’s mantle. In the area Jim will dive, the Challenger Deep is less than a mile (about a kilometer) wide. This means that Jim, piloting the DEEPSEA CHALLENGER submersible, should have plenty of time to explore the entire area while stopping to collect rocks and biological samples and to take push core samples of seafloor sediment. We scientists on the expedition are practically drooling in anticipation! Filed under Inside the Expedition and tagged patty fryer, profile, science.